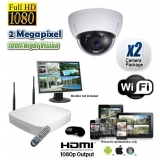 Wireless Security System Setup from CCTV Camera World on Vimeo. 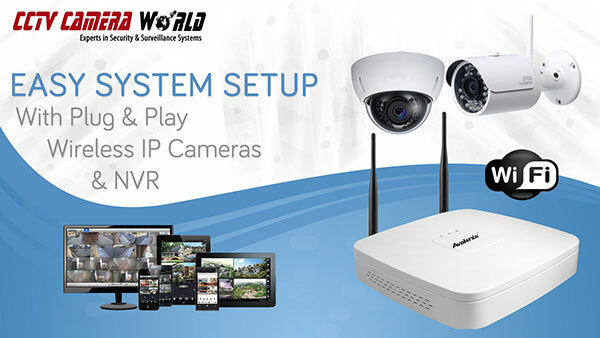 Wireless security camera systems by CCTV Camera World are a reliable alternative to wired security camera systems for customers looking to avoid having to run cabling. Wireless security cameras are great for a home or business where it is either impossible or cost prohibitive to run security camera cabling. However, wireless cameras still require power from either a 110V AC power outlet or solar panel for continuous operation. Whether you are looking for a Wireless HD Camera System for use up to 300ft from the recorder, or a large scale wireless camera system for a business, our wireless security cameras can get the job done. All of our wireless camera kits below feature a WiFi NVR that can support up to four WiFi security cameras using encrypted wireless signals to protect video from hackers. These wireless HD camera systems also feature plug & play technology that makes it easy to install the cameras and requires no configuration from you to get the cameras connected to the wireless NVR. If you require a wireless camera system with more than 4 cameras, please contact us with a site diagram of your property with proposed locations of cameras and recorder, and one of our experts can recommend the necessary products. Professional wireless security camera systems require professional site planning to ensure signal reliability as explained in our wireless security camera guide. Our wireless cameras are designed to handle the elements outdoors thanks to their IP66 weatherproofing, and come equipped with 100ft of night vision to see in complete darkness, and remote viewing capabilities from a computer, smartphone, or tablet when internet is available at the system location. 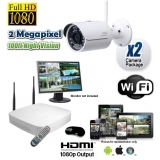 Click to browse our selection of wired security cameras.